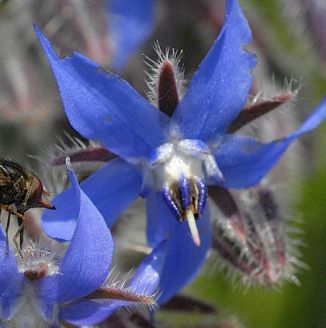 Borage is not easily confused with other wild plants on this web site. 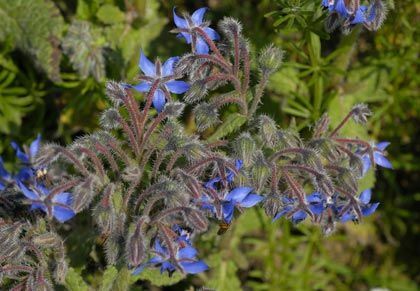 A bristly annual plant, Borage grows on arable, disturbed places and is also found in gardens where it is cultivated for its leaves which have a cucumber like flavour. It stands to 60 cm high, and bears very pretty star-shaped blue flowers (20–25 mm across) in drooping, loose, leafy clusters from May to September. The five petals are narrow and backward pointed, the dark sepals appearing between them, and at the centre of the flower is a column of purple-black anthers grouped together and projecting. The leaves are pointed with wavy margins, the lower ones stalked and the upper clasping the stem. This is a garden escape which becomes naturalised on occasion. It belongs to the Boraginaceae family. My first record of this plant is from the railway line at Killiney, Co Dublin. At one time there were few trains on this line on Sundays and it was safe to walk along. Now, with the regular traffic of the DART (Dublin Area Rapid Transport), there are no opportunities for walking the line, looking for wildflowers. Coincidentally, this plant was listed in Nathaniel Colgan's Flora of Co Dublin (1904) in which he wrote: 'Several plants by the railway at Vico, Dalkey, 1901-2 ... a garden outcast' . I took these photographs near Kilmore Quay, Co Wexford in 2008. The flowers of this plant are used to garnish summer drinks such as Pimms and also in fruit salads where the sweet taste is appealing. Gerard's Herbal of 1597 said that flowers were used in salads to 'exhilarate and make the minde glad' and Mrs Beeton had another recipe for 'making the mind glad' in her recipe for a Claret Cup which contained 1 bottle of claret, 1 bottle of soda water, crushed ice, 1 liqueur glass maraschino, 4 tbsp caster sugar, grated nutmeg and 1 sprig of green borage.